Run the Landmark trail run! Run the Landmark is a wooded trail run that takes runners through Mille Lacs Kathio State Park, which represents a majority of the Kathio National Historic Landmark District. All proceeds from Run the Landmark will go to the Children’s Shelter of Cebu, an orphanage in Cebu, Philippines that provides homes for orphaned, abandoned, and surrendered children. Dirty Dozen: This 12K trail run through the woods is characterized by demanding hills during the middle miles of the race. The trail takes runners over grass, gravel, and wooded trail terrains. 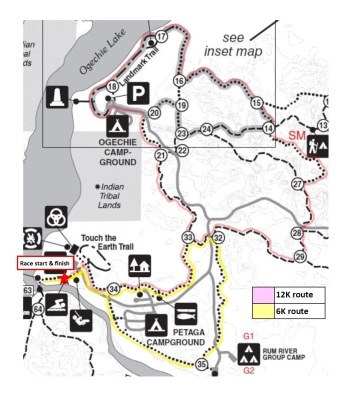 Scenic Six: This 6K trail run/walk brings participants through the woods primarily on grass trails and includes some gentle hills. This route is a great introduction to trail running. Awards will be presented to the top 3 overall male and female finishers for both the Dirty Dozen and Scenic Six. The race takes place at Mille Lacs Kathio State Park. The race will end around 11:00, although participants are welcome to continue to run or hike trails throughout the park – including the trails used for the race – after the race has finished. Participants should plan 15 minutes to drive from the park office to the race location. Parking is available at the Interpretive Center/Picnic Area parking lot. Once the lot is full, parking attendants will direct cars to park along the road. Because parking space is limited, we encourage Run the Landmark participants to carpool if possible. All cars must display a valid State Park permit. For participants who already have an annual State Park car permit – Stopping in the office is optional; feel free to proceed directly to the Interpretive Center/Picnic Area. For participants who need a daily use park permit – Stop at the park office, and identify that you are a race participant. A daily pass will be provided to you. If you proceed to the Interpretive Center/Picnic Area without a valid state park permit, your car may be ticketed, and you will be responsible for paying for the ticket. The races will start and finish near the picnic area. Follow park signs to the Interpretive Center/Picnic Area. You could be a 2019 Run the Landmark sponsor!